April 14-20, 2019 Horse Drive from Wyoming winter pastures to Montana Ranch. April 19-20, 2019 Real Ranch Horse Sale – Billings, Montana. June 2-9, 2019 Gathering mares and adding stallions for the breeding season. October 13-19, 2019 Registration of weanling colts, putting mares out for the winter. Oct. 27-Nov. 2, 2019 Horse Roundup and drive to Wyoming. April 28-May 4 Trailing cows and calves to Montana Ranch from Wyoming pastures. May 5-11 Trailing cows and calves to Montana Ranch from Wyoming pastures. May 12-18 Trailing cows and calves to Montana Ranch from Wyoming pastures. May 19-25 Trailing cows and calves to Montana Ranch from Wyoming. Sept 22-28 Gather to bring to the corral Jeff’s cattle to sort, wean, and haul to Wyoming. Pregnancy test and reride pastures to find any cows and calves we have missed. Sept. 29-Oct. 5 Gather Matt’s cattle to sort, wean and haul to Wyoming. Reride pastures to find any cows and calves we have missed. Oct. 6-12 Gather Jen’s cows and wean calves and haul them to Wyoming. May 26-June 1 Branding, doctoring calves, gathering into the trap to brand. June 2-8 Gathering mares and putting the stallions with them in mare bands. June 9-15 Branding calves returning pairs to mountain pastures. June 16-22 Finish up branding and take cows to distant pastures. June 23-29 Checking horses and doctoring calves and fixing fence of our ranch. July 7-13 Pushing cows and calves to Fishbird pastures and in Spring Creek Pasture, doctoring calves and fixing fence. July 14-20 Checking heifers on south pastures, riding neighbors to bring back strays, doctoring heifers if needed. Halter breaking colts and riding young horses. JULY 21-27 Booked for Young Marines Cowboy Adventure. July 28-Aug. 3 Checking cows, calves and horses on Flat Coulee Pasture and Bassett Pasture. August 4-10 Pushing cows and calves back up on mountain pastures. Halter breaking colts. August 18-24 Riding southern pastures check heifers and mare bands. Aug. 25-31 Pushing cows and calves back up on higher mountain pastures for grazing. Sept. 1-7 Riding outside pastures as well as Dryhead pastures. Rotating pastures. Sept. 8-14 Moving cows from back side of Little Mountain as weaning starts in 3 weeks. Sept. 15-21 Moving cows close to ranch. Sorting off neighbor cattle. Getting ready to wean. 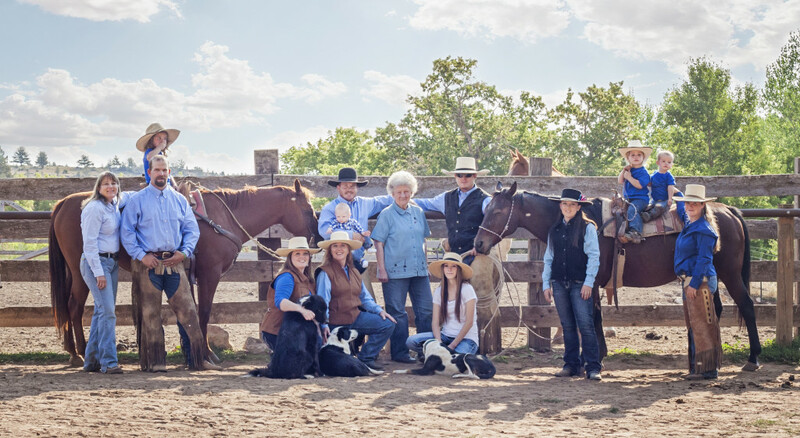 There is a transfer charge of $100.00 per person for pickup in Billings on the day of your arrival to come to the ranch and we return you to Billings on the following Saturday by noon. We have three places we pick up on the Sunday of your arrival: Best Western Clock Tower Inn and Dude Ranchers Lodge and the Billings airport. If you choose to stay at another hotel, please make arrangements to meet us at the airport at 4:00, at Door Four at the west end of the airport. Check the website for a list of “THINGS TO BRING”. Always consider the weather. There are two types of accommodations you can choose: the bunkhouse rooms or three separate, private cabins with bathroom are available for $250 per couple and $150 per single person. The smaller private cabin has a detached bathroom for the same $250 per couple and $150 per single person. Our semi-private bunkhouse rooms have two shared bathrooms and each private room has a queen bed, or twin beds to accommodate families or groups. The bunkhouse rooms are included in the weekly cost of our cowboy vacation. Ask when booking for what fits your needs. Flying into Cody, Wyoming has also been a popular alternative. It is a fun western town with Memorial Day to Labor Day nightly rodeos and the best Western Museum in the West. Cody offers a great western atmosphere and shopping, rental cars and closer access to Yellowstone National Park.